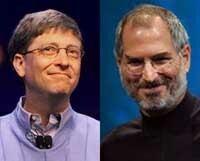 Legendary technology rivals Bill Gates and Steve Jobs made a rare joint appearance and wasted no time making nice. "Bill built the first software company in the industry," said Jobs, co-founder of Apple Inc. "Bill focused on software before anyone." Gates, the Microsoft Corp. co-founder, hailed Jobs for taking big risks and developing products with "incredible taste and elegance." "What Steve has done is quite phenomenal," Gates said. That set the tone for a 90-minute chat Wednesday in which the two computer industry icons fielded questions from Wall Street Journal columnist Walt Mossberg and technology reporter Kara Swisher at the newspaper's "D: All Things Digital" conference. Jobs and Gates reminisced about early days working together in the 1970s, interspersing their views on the current state of technology. When Swisher asked for the greatest misunderstanding about their relationship, Jobs joked: "We've kept our marriage secret for over a decade now." Gates added: "Neither of us have anything to complain about, in general. ... It's been fun to work together." The two touched briefly on the 2008 elections, which include the race for the White House and for some seats in Congress. Gates said candidates should be measured on their ideas for improving education. Gates and his wife, Melinda, created the Bill and Melinda Gates Foundation in 2000, which is now the world's largest philanthropic foundation. The foundation gives a majority of its grants in the areas of world health, global development and education. Although the two worked together in the 1970s - Microsoft even invested in a struggling Apple in 1997 - the companies have remained fierce rivals. Gates dropped out of Harvard University in 1975 to found Microsoft with childhood friend Paul Allen and turned the company into the world's largest maker of computer software. Jobs and friend Steve Wozniak founded Apple in 1976, five years before IBM Corp. jumped into the personal computer market. Jobs left Apple in 1985 following a struggle with the company's board, but made a triumphant return in 1997 when Apple was struggling to survive. Jobs is widely credited for Apple's renaissance with a string of innovative products - the iMac computer for consumers, the powerful PowerMac and PowerBook, and more recently, the iPod digital music player. Microsoft has long dominated with its Windows operating system and software programs like Excel and Office, but Apple scored big with its iPod, introduced in 2001, and its iTunes online music store. Next month, it introduces its much-anticipated iPhone mobile handset. Microsoft released Zune music player in November to compete with iPod. An audience member later asked the two men what they learned from each other. "The way he does things is just different. It's magical," Gates said. Jobs said he admired Microsoft's ability to collaborate with other technology companies. "They learned how to partner with people really well, and I think if Apple could have had a little more of that in its DNA, it would have served it extremely well," he said.